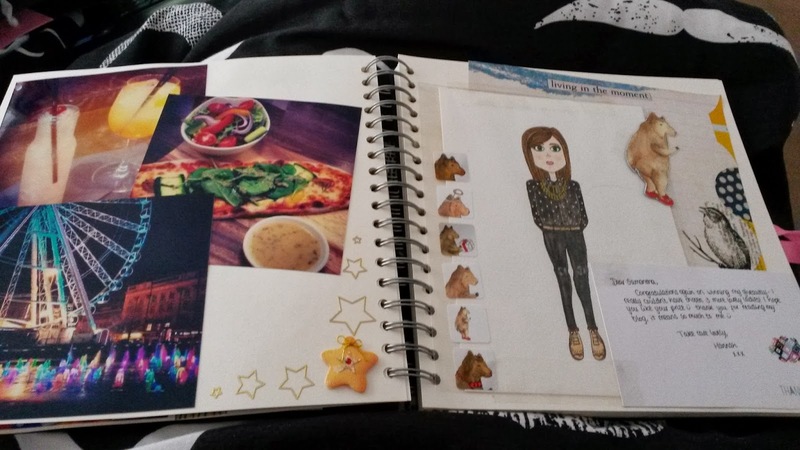 Over Christmas, I decided to finally start a scrap book. I've been wanting to for ages but I've been weighing up whether it's for the right reasons or not. I want it really for two reasons; A) to document my life at University and B) so I can look back one day and see how much progress I have made! Part of me wondered whether the second reason would keep me more absorbed in my illness but I actually think I'll look back and only see positive things! I've done a few pages, sticking down tickets from shows, traveling and pictures from instagram. And, I've cut up Birthday/Christmas cards for letters and cute pictures which decorate the pages nicely :) These pictures are of my favourite pages so far! One is a Christmas spread, and one is of my trip to Manchester and the beautiful illustration that Hannah did for me, from her giveaway last year! I've really enjoyed starting this and hope I don't give up half way through, leaving it unfinished!! Also, if anyone has ideas of what else I could include, or what you put in your own scrap books (if you keep them? ), then your ideas would be very welcome! As a fellow sufferer of mental illness, I don't think it is a bad thing to chart your journey. It helps you to see how far you have come, and if you do slip back it helps you to see what you are capable of achieving because it is right there in black and white. Good luck with your scrapbook. Yes I think it'll be very positive! You've made SO much progress and I think it's brilliant that you'll have something to actually look at and remember instead of just having the memories in your head. Who knows, maybe one day you can show it to someone who is going through something similar and it will be really inspiring to them!